Lucky Casino is a brand new Swedish online casino that is obviously trying to maximise its members’ luck and therefore winnings. The casino is host to games from a number of developers including BetSoft Gaming, Microgaming and Net Entertainment. As a result many of the most popular games can be found as well as some from lesser known developers. The games are divided into slots, jackpot games and table games and there is also a live dealer casino. In total there are 629 games to enjoy with enough variety to satisfy all players. 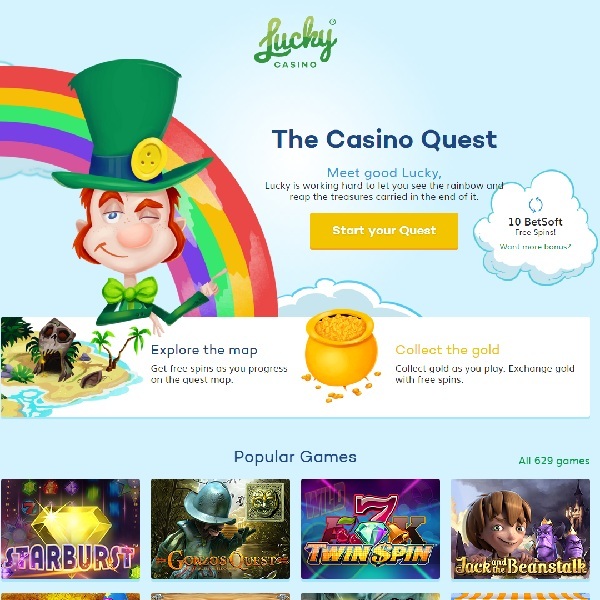 New members of Lucky Casino will be given 10 free spins to use on BetSoft Gaming slots. This is followed by a 100% first deposit bonus up to €500, a 50% second deposit bonus up to €1000 and a 25% third deposit bonus up to €2000.